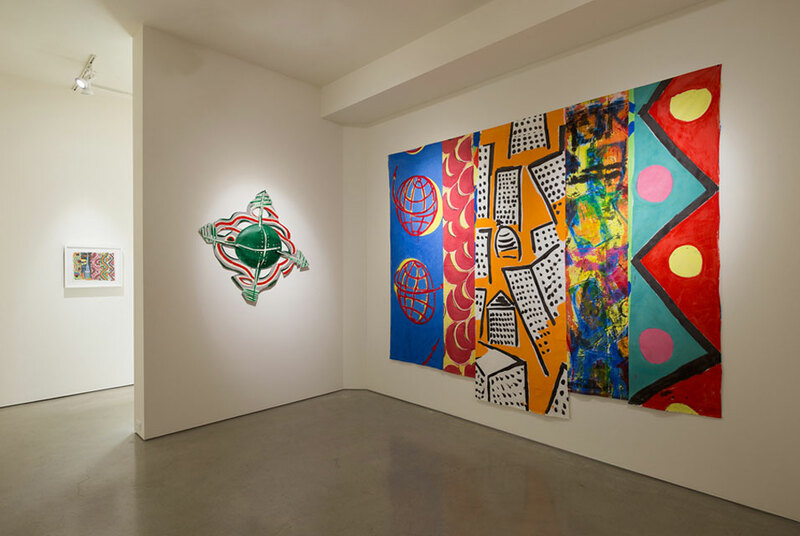 Looking at the images of Kim McConnel’s newest show “Work from the early 1980s and mid 2000s by Kim MacConnel on view at Quint Contemporary Art” on artdaily.org reminds me of how invigorating I still find the Pattern and Decoration Movement. So nice to know that art can be upbeat and that others both continue to find his work worthy of exhibition and that retired professors count! Installation View – KIM MACCONNEL – Luft Gesheften: The Value of War. April 12 – May 31, 2014. Photo: Philipp Scholz Rittermann. LA JOLLA, CA.- Quint Contemporary Art announces the opening of Luft Gesheften: The Value of War, a presentation of work from the early 1980s and mid 2000s by Kim MacConnel. This is MacConnel’s ninth solo exhibition at QCA. “MacConnel’s achievement is to have taken the attitudes of modernism and redrawn them in his own style, presenting his images in the incongruous, purportedly light-hearted manner of the decorative in order to convey a distinctly ironic sense of our preeminently militaristic, industrial landscape.” – Steven Henry Madoff, Art in America, Summer 1982 In 1982, Kim MacConnel mounted an exhibition called Luft Gesheften, in which the artist interpreted a Yiddish phrase meaning “Air Business,” as in made up, made of nothing, not real business. The “not real” business that he was referring to was war. As MacConnel states, “military buildup to it (war) is based on a perceived threat, something that is real or built up to seem real: hence air business.” In a world just as tumultuous as in 1982 (MacConnel’s work was in response to President Reagan’s challenge to the Soviets through military buildup), the years leading up to today have seen wars waged in Afghanistan and Iraq where the perceived threats seemed to be not much more than a hostility toward democracy and perceived threat of weapons of mass destruction. MacConnel’s “money” collages from 2005 are small tableaux’s which use American dollars and other currency, such as Afghan afghani and Vietnamese dong, in the shapes of fighter planes and bombs. The collages are a direct reference to the Afghan and Iraq wars, and the monetary value placed into these military battles. Created using gouache, pencil and the paper money from countries that have been in significant wars with the United States, the pieces stand as a symbol of excessive spending and landscapes transformed. MacConnel was a leader in the 1970s Pattern and Decoration movement, and since then has been using colorful fabrics, found materials, garishly bright paint, and black humor to bring light to much more than just decoration. In using material that is easily accessible by the viewer, MacConnel has been able to address many social issues including warfare and monetary excesses through his art. The paintings on fabric that will be central to this exhibition use iconography in snippets to call to attention to larger themes. Factories, bomber jets, bombs and peace signs mix together with abstract color fields to address the issue of war. Kim MacConnel retired as professor of painting at UCSD in 2009. MacConnel’s work has been shown in solo exhibitions in Los Angeles, New York, Madrid, Tijuana and Cologne; the Museum of Contemporary Art, San Diego held a retrospective of his work called Collection Applied Design in 2010. MacConnel was the first artist to create a mural for the Murals of La Jolla project, which can be seen on the back of the building at 7724 Girard Avenue. MacConnel’s work is in the collection of many institutions including Albright-Knox Gallery, Buffalo, NY; Museum of Contemporary Art, Los Angeles; Museum of Contemporary Art, San Diego; San Francisco Museum of Modern Art; and the Whitney Museum of American Art, New York. MacConnel currently lives and works in Encinitas, CA.